Boys U16 doubles Pui (left) and Voon posing with Wong and Abdul Hadi after receiving their prizes. 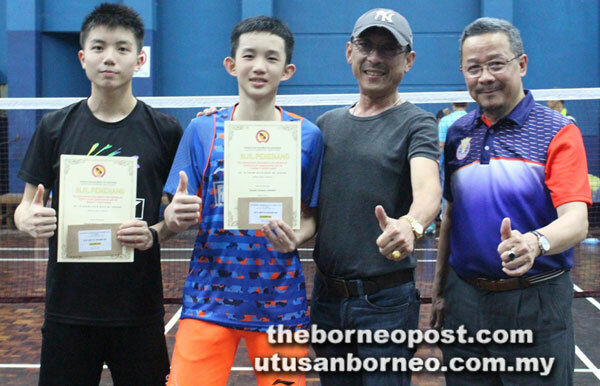 KUCHING: Shuttlers from Kuching and Miri shared the spoils in the 1st Leg of the Sarawak Junior State Closed badminton tournament that ended at the Sarawak Badminton Association (SBA) hall along Jalan Lapangan Terbang on Sunday. The biggest winners were Chong Cheong Yong (CCY) Training Centre of Kuching who claimed four titles and CMBC of Miri who lifted three. Pui Wee Young of CCY beat Joshua Voon Ern Hua of SBA 2-1 (21-15, 18-21, 21-15) in the final to win the Boys U16 singles crown. Joint third place were siblings Radzien Jawharee Jemain and Riefhan Jawaheer Jemain. 15-year olds Pui and Voon, the top seeds, teamed up in the Boys U16 doubles to register a 2-1 win (13-21, 21-16, 21-18) over joint third and fourth seeds and 16-year olds Chen Zi Quan (CCY) and Goh Shun Khiat (SBA) in the final. Taking the bronze medals were Radzien-Riefhan and Anderson Yeo Sonn Kai (CMBC) and Benedict Chan Sheng An (SBA). The Girls U16 doubles final saw Adrienne Chan Yi Ning and Samantha Lee Harn Rou of Liew Wah San Badminton Training Centre (Miri) beating Ho Sing Yen (Bernard Phoa Training Centre) and Olivia Hiu Liying (Everspring Racket Club) in straight sets 21-19, 21-18. Joint third were CMBC pair Sim Jia Min-Yong En En and Karin Sophia Ng-Serena Chin Wei Xian from Kuching Badminton Association 2016. Meanwhile, Wong Ling Ching of LWS surpassed expectations when the third/fourth joint seed outplayed another third/fourth joint seed shuttler Kashley Kho Tze Yin of SBA 21-7, 21-12 in the Girls U16 singles final. The bronze medallists were Olivia Hiu and Samantha Lee. CCY’s other titles came from Audrey Vanessa Chee in the Girls U14 singles, Jeremy Juan Zhen Liang (Boys U14 singles), Ashreney Kho Jia Min-Genieve Lim Tsen Yeen (Girls U12 doubles) while SBA’s only title was delivered by Clement Jong Wei Zhi and Felix Fong Jia Liang in the Boys U14 doubles after they beat Darrent Lim Lian Zhan and Jeremy Juan 21-18, 19-14 (retired) in the final. Other champions in this tournament organised by SBA were Angel Chin Onn Qi of CMBC (Girls U12 singles), Shawn Hiu of ERC (Boys U12 singles) and the combination of Bernard Rusell Bayan (CMBC) and Shawn Hiu (ERC) in the Boys U12 doubles. 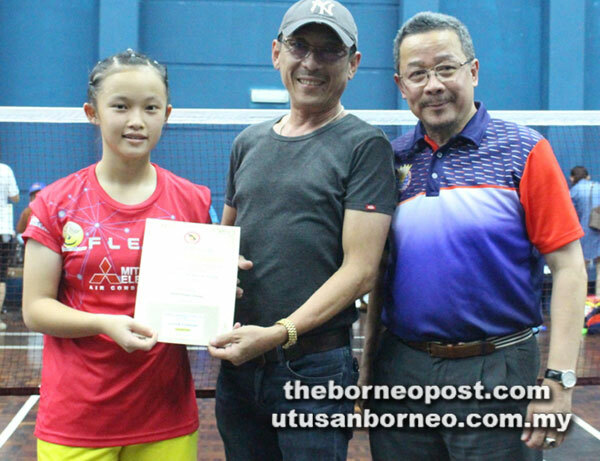 The tournament was mainly aimed at selecting players to represent Sarawak in the National Junior Circuit Zone C (1st Leg) in Putrajaya from Mar 7-11 and National Junior Circuit Zone C (2nd Leg) in Malacca from May 5-6. A total of 272 shuttlers from all over Sarawak took part in the three-day event. Wong Ling Ching receives her prize and certificate from SBA deputy president Allen Wong Siew Poh (centre) while SBA secretary Abdul Hadi Abdul Kadir looks on.